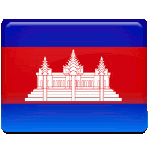 Until the 14th century the present-day territory of Cambodia was ruled by the Khmer Empire, that was a powerful state. After a long serious of wars with neighboring countries the capital of Khmer Empire was sacked by the Ayutthaya Kingdom and soon it was abandoned. The civil wars and rivals with other countries led to the fall of the Kingdom and the Cambodian monarchs had to seek for European help. King Norodom signed a treaty with France renouncing suzerainty over Cambodia in exchange for the control of two provinces, that became a part of Siam (present-day Thailand). The treaty was signed in 1867, thus Cambodia became a French colony and it was administered as a part of French Indochina. France started manipulating the choice of the king, installing the leaders, who were week enough to manipulate. After the death of Norodom it installed his brother, Sisowath, who ruled Cambodia till 1941. When the throne became vacant, France chose to install young Sisowath's maternal grandson Norodom Sihanouk, thinking he would be easy to control. However, Sihanouk led Cambodia to its independence, that the country officially declared on November 9, 1953. Main celebrations of Independence Day take place in the capital of Cambodia. King of Cambodia attends the morning ceremony, that is organized at Independence Monument. Later a gala parade is held in front of the Royal Palace. A large firework display marks the end of the festive events.